In 1977, we began our successful action on the diamond tool manufacturing market. Since then, we have always taken our objectives, quality and deadline reliability with maximum customer satisfaction as the standards for our work. Our extremely well-qualified employees provide the basis for the positive development of the company. High-end tools for many branches, tried and tested, economic, capable of high performances: these are the original IDEMA diamond tools. Certified since 1996 acc. 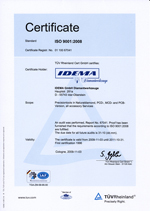 DIN EN ISO 9001:2008.